Writer, director and performer Jonathan Biggins has been a key player at STC for many years. As one third of the brains behind The Wharf Revue, he has danced up a storm and delivered endless laughter with his iconic impersonations of Paul Keating, Tony Abbott and Bob Brown to name a few. 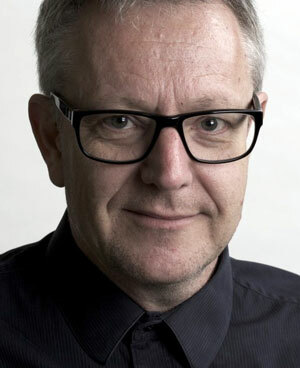 As a director, he's brought to life the manic behind-the-scenes antics of Noises Off in 2014 and, as a writer, put local councils up for satirical analysis in Australia Day in 2012. What was the initial impetus for writing Talk? Talk started to form in my mind as I watched with dismay the decline of quality journalism under the assault of the 24-hour news cycle and the proliferation of new media. If everyone can be a journalist, then no-one is. We forget that journalism was invented as a way to filter the gossip and rumour of the coffee houses, an attempt to sort out the fact from the fiction and give society some kind of accepted truth as a foundation to work from. Of course, truth is relative – to a point – but as journalism improved, particularly the expensive and difficult investigative variety, we found out more of what vested interests wanted to hide. Today, we have more information than ever before but, paradoxically, know even less. Brexit is a classic example – despite the millions of words generated about the issue, people knew less about the facts after the arguments were presented than they did before! The media today has collective ADHD; by constantly skimming the surface we rarely find out what’s happening underneath until it’s too late. You’re well-known for your work writing and directing comedies but Talk also deals with serious political and social issues. How would you describe it? The play is a dark satirical comedy and it’s about a serious subject – in this case, the perversion of justice through our insatiable thirst for an update, the changed headline, the fast-breaking story. News is now too often presented as the immediacy of conflict; ever-larger storms in ever-diminishing teacups. We get the where, the who and the what but there’s no time for the why or the how. Basically, the play looks at the response of three different media outlets to the abandoned trial of a man accused of sexually assualting a thirteen year old – and doesn’t that sound like a fun subject? But after all, comedy is tragedy plus time. Looking at the changing media landscape, what have we lost and what have we gained since the internet came along? The more I see of the internet, the less I like. I can’t help thinking of frogs in water being slowly brought to the boil and, if we’re the frogs, our legs are tied together and there’s no jumping out. People forget that the Luddites were actually right; they feared the destruction of their way of life (one they were quite happy with) by technology and that’s exactly what happened. In many immediately apparent ways, the internet has been marvelous – thank God we can live-stream a suicide to our friends on Facebook. Perhaps if we had real friends we wouldn’t need to. From a media point of view, the economic effect has been devastating. There is no sustainable business model for serious journalism available through the internet. And I’ll make a brave call: there never will be. Increasingly, public broadcasters will be the only outlets capable of producing it but even they are being run by technocrats who have surrendered to the mediocrity of digital news gathering and baulk at the notion of "legacy media" (as an executive of ABC Digital patronisingly referred to TV and radio at last year’s Walkley Awards). You have veteran actors John Waters and Peter Kowitz in two of the main roles. What were you looking for in casting the play? Yes, we do have some "legacy" actors in the cast – that’s the best thing about live theatre: it’s the one thing you can’t get on the bloody internet! But the play being set predominantly in conservative institutions – talkback radio, the editorial level of News Limited and, to a lesser extent, ABC radio news – influenced the casting quite heavily. Glad to say we have gender equality and we are non-ageist (ie there are seniors card holders amongst the cast). Yes, it’s a satirical comedy but it has a very naturalistic heart, it moves almost in real time and presents a less-than-pleasant side of our contemporary public debate. Top night out all round!